Where to begin?! Well there were the holidays! Thanksgiving and Christmas… yep they were fun, crazy busy fun. It was all just a total whirlwind this year with Emma joining the crew and bad blogger/mommy was so over it, that she pretty much left her camera at home the entire time. 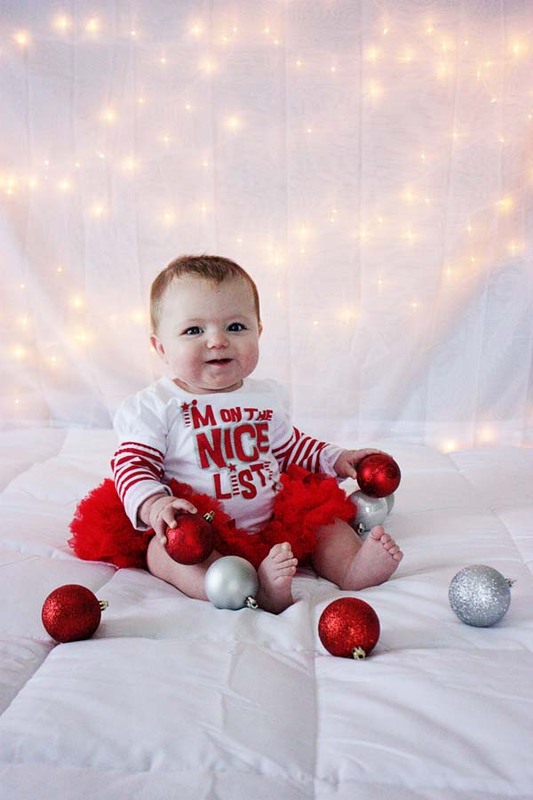 When we made the list after Christmas, Emma was 7 ½ months old, and really working on her crawling. We knew that this one would be a priority. We have been discussing carpet for a long time now, and needed to settle on a game plan. 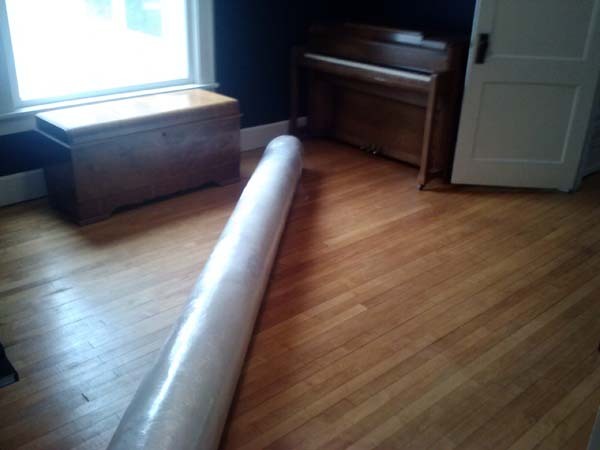 See our house still has its original hardwood floors, and they were recently refinished before we moved in… covering them up seemed like a crime. But, I continued to insist that one room in the house have carpet for kiddos to crawl around on. After some debate, the den was the lucky winner. 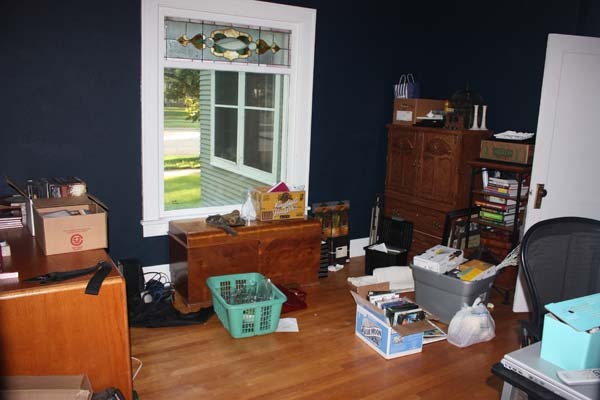 This room has been a dumping ground for the 2 ½ years we’ve lived in this house, an unused, gather all room. Time for a change! We decided that we are going to turn this into a cozy little family room, complete with carpet! First step, clear it out. It’s about darn time! The upstairs bathroom has been in a state of total disarray since January of 2011! See that January, I started working on our little guestroom upstairs, remember this little post? 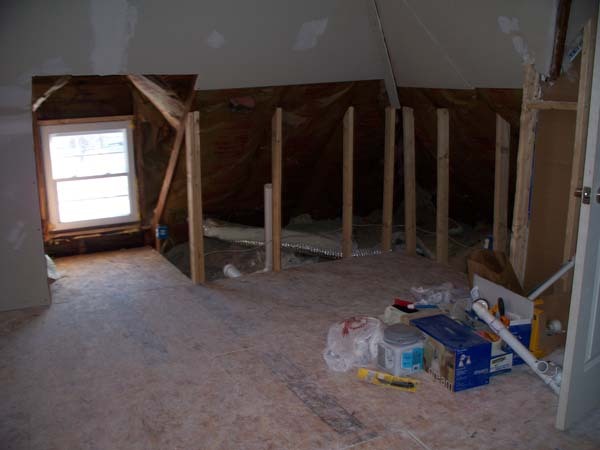 While I was working on demoing this room, my husband got the itch to demo the bathroom, with no plan on how to fix it. Yeah. He pulled out all the cabinets/shelving… it still looks like that two years later. Sorry – no photo right now… bad blogger. But, n his defense, the shower dripped before the demo. He removed the cabinets to access the plumbing and he fixed the drip. But that’s the only thing we’ve done to this bathroom. So this will be a major focus this year. The plan will be laid out at a later date on the blog, but overall we are looking at a total gut job. New sheetrock, flooring, shower, vanity, storage, mirror, lighting and HEAT, yes HEAT! In our century old home, neither of our bathrooms is heated… this is going to change! Yep, we are the homeowners that fix the main problem and don’t finish up the job. 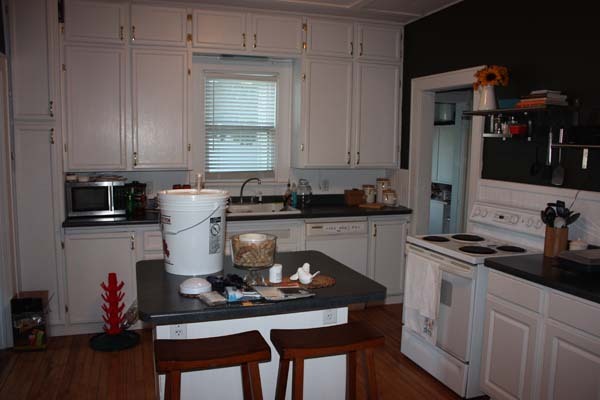 Like with the bathroom, we fixed the drip and walked away… the same goes for the porch. Remember during the summer of 2011, we replaced the roof on the porch? Yep, it had a leak. So we fixed the leak and walked away. This left our porch an empty shell for over a year and a half now. Well that’s about to change. This year we will finish off the ceiling and install the lighting. 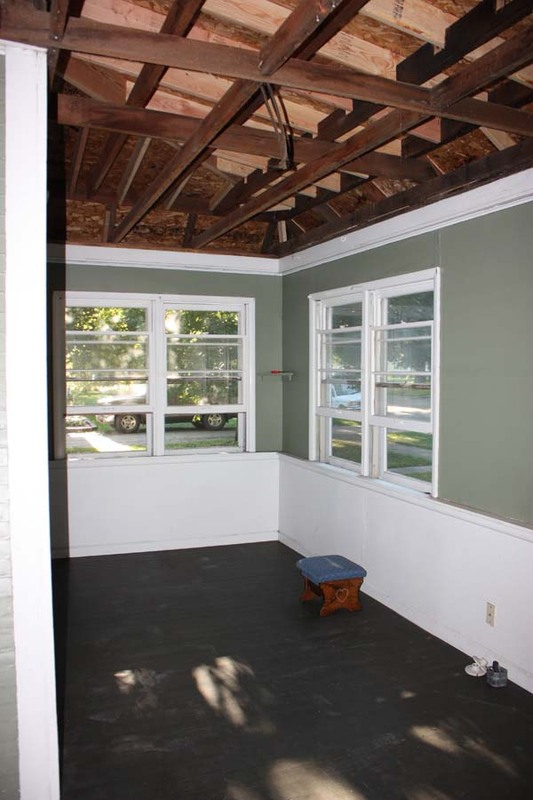 The type of ceiling is still being debated, and whether to insulate or not is still in question also. Either way… the budget is set and we’ll have to work around that, because I’m a stickler like that. But I’m pretty positive we can come in under budget considering all I want to ensure is that a ceiling goes in, as well as lighting… we’ll fill that space another year. My personal goal – come in way under budget and put in a new exterior door! 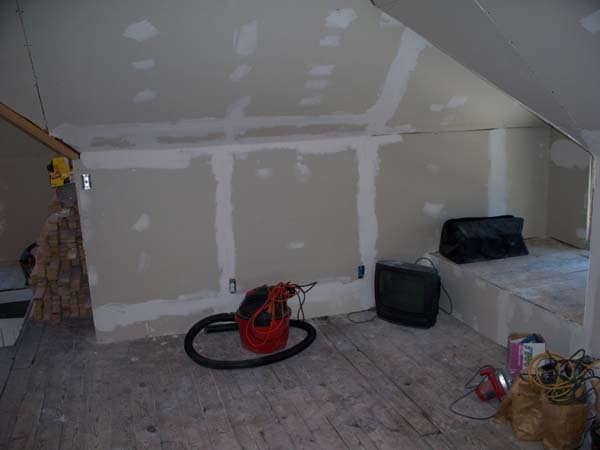 The previous owner had a dream to turn this into a master bedroom… insert eye-rolling here. First issue, you access the attic through a closet in one of two bedrooms. Second issue, laundry is in the basement. Third issue, they had no clue what they were doing! The sheetrocking job looks like it was patched together by a first grader, and bonus, they forgot to install a vapor barrier behind the sheetrock. So this pretty much leaves this entire space useless for anything but storage… which is fine by us! We knew about all of these things before purchasing the home, so we have simply used it as storage since we moved in. Well this year, we are going to gut the attic… Why?! Because we are losing heat. When they began their master suite adventure, they ducted heat into the attic and without proper insulation, we are now attempting to heat the neighborhood. So we simply intend to gut it and get it back to its former glory, keep the heat in. We aren’t exactly sure what this will entail, but we are budgeting high to hopefully cover anything that may pop up! Fingers crossed people! Our kitchen is one of the hangouts in our home, and it needs a facelift. While this is not really a “functional” task like the other four goals, it is one that will bring a smile to our faces. The cabinets on our west wall around the sink are original (the island and counter between stove/fridge are from Ikea), and they could use a little love! Well, those are our large goals this year – totaling a whopping $4000. Whew. Now those of your who know me well… understand that in my mind, that is a lot of moolah, imagine all the fun you could buy at Goodwill with $4000! But it’s time to think larger… and tackle some of these bigger items. We also have small goals to complete, the stuff that keeps me sane during all the chaos… those haven’t been dumped, but they are getting minimal funding this year. 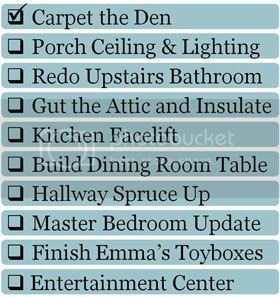 For example, I’m currently in the middle of a master bedroom makeover, with a total budget of $100. Yeah. Tight. But we’ll discuss those smaller goals as we get to them.